Only 2 weeks left in my exhibition at Buy Some Damn Art. I found the pranks between the terrible couple in The Twits to be wicked yet entertaining, which is why I read the book so much as a kid. One particularly gruesome trick that inspired the design for this binding was the worm spaghetti that Mrs. Twit served Mr. Twit. This devious couple live in a cement windowless house complete with a rotting garden, caged monkeys and a big dead tree where Mr. Twit captures birds for pie. The couple get what they deserve in the end as the monkeys and birds play their own clever trick on them, turning their home upside down. I bound The Twits in the millimeter Rubow style with white buffalo skin lining the head edge and flanelle buffalo skin lining the tail edge. The color of the leather wrapped headbands correspond to leather edge. The paste paper was a simple design of free forming squiggles painted on with a long bristled brush. The initial layer was a mixture of titanium white acrylic, water and wheat starch paste. For the next two layers I added a bit of bone black and cerulean blue acrylic to create a blue gray ending with a match for the flanelle buffalo. The title was stamped with Centaur handle letters in carbon. The edges were painted with a light gray acrylic mixture. 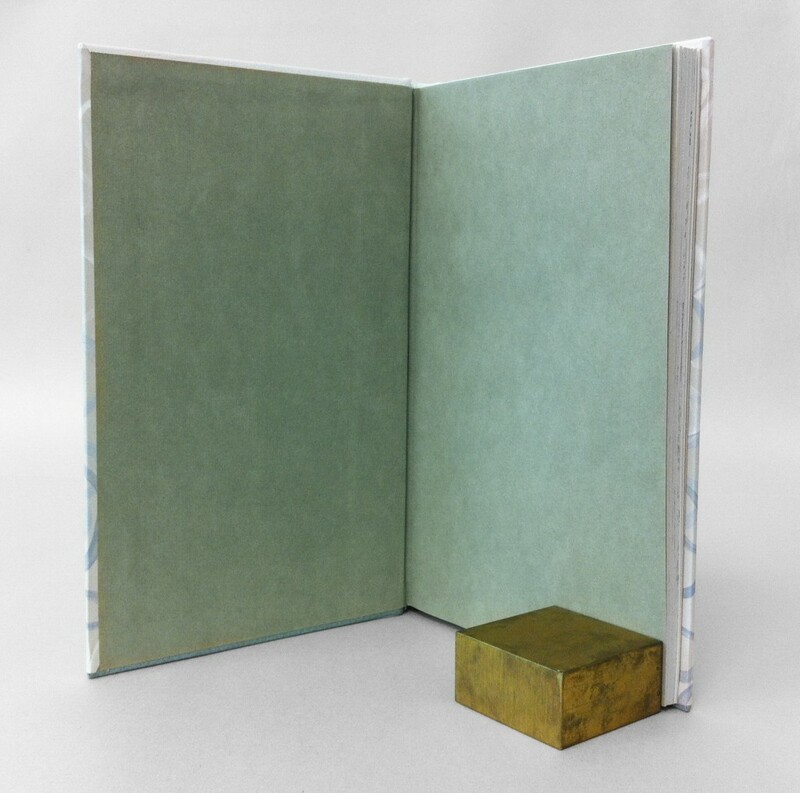 The book opens to reveal smoke Hahnemuhle Ingres paste downs with light gray Hahnemuhle fly leaves before reaching the text block. 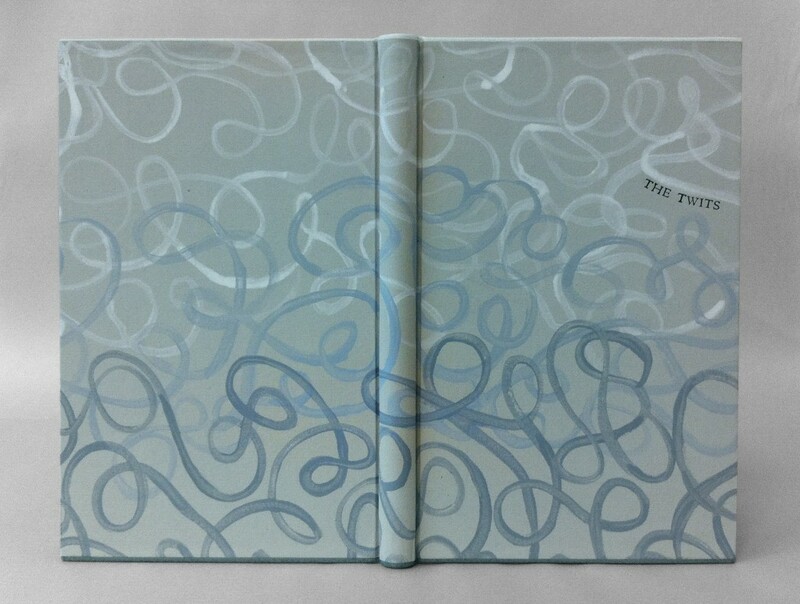 I wanted to keep the book to be as gray and drab as possible, representing the sad existence of the Twits inside their cement home. The book is housed in a clamshell box. The trays are covered in smoke Hahnemuhle Ingres and lined in light gray Ingres. 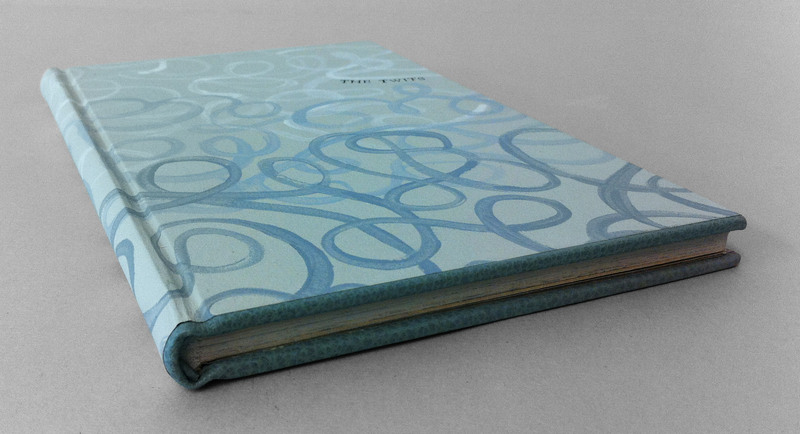 The case is covered quarter-style with black Iris bookcloth and smoke Hahnemuhle Ingres.